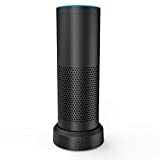 Last week we told you about the MegaBoot, an awesome accessory that transforms the Amazon Echo into a portable Alexa speaker. The MegaBoot provides a whopping 18 hours of battery life, which is clearly impressive. It’s priced a bit steep at $90 though, and people have asked us if we know of a more affordable option. Well, the answer is we do. Check out the Smatree Portable Battery Base for Echo, which is about half the price of the MegaBoot and offers 6 continuous hours of playback per charge. Smatree AE9000 comes with Four LED lights which indicate power levels clearly.It helps you know the power condition well and charge it timely. Smatree base is connected by a DC connector. You can install it with just TWO STEPS.Without the cumbersome of cable,you can install the base very easily and quickly. There are two optional charging ports for charging the base. You can charge it with original AC adapter, power banks or laptops at your convenience.